Excerpt: In this post, we will highlight the main concepts from the work of Nobel prize winner Richard Thaler as explained in his bestselling book ‘Nudge.’ We will explain what nudging is all about, how it related to behavioural economics and how you can use it to influence people and help them make better choices. Nudging comes from the field of behavioural economics. 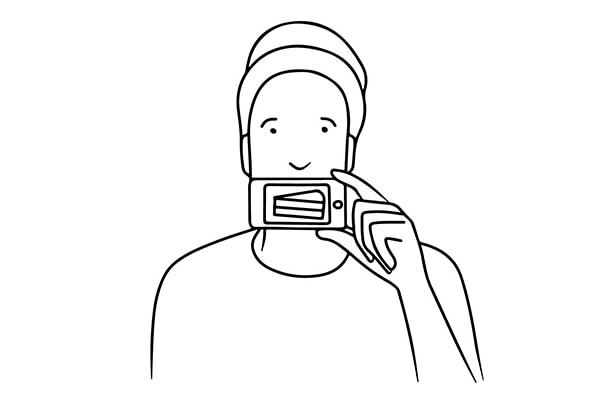 Although behavioural economics is a science that is studied for almost forty years, it was the book ‘Nudge’ written by Richard H. Thaler and Cass R. Sunstein in 2008 that put nudging on the map. 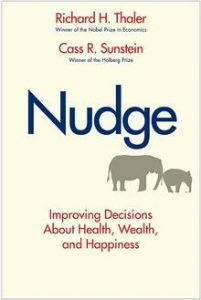 In Nudge, Thaler and Sunstein propose us a new take on decision making, one that takes our humanness and all the inconsistent decisions we make as a given. Whereas traditional economics see people as rational beings, who make decisions and do cost/benefit analyses to make a choice that is always in their best interest not letting their emotions cloud their judgments, and always thinking about the future. Behavioural economists overthrow this, as it doesn’t fit the actual behaviour of people. You see people choose mortgages they shouldn’t be taking. You see people overspent on their credit cards. There are stock bubbles. Where’s the rationality in that? We are humans whose decisions are driven by cognitive bias and sub-conscious mental shortcuts, as we explain in this post on Daniel Kahneman whose research laid the foundation of all behavioural economics. In the book ‘Nudge’ is also explained that being human, we all are susceptible to various biases that can lead us to blunder. Our mistakes make us poorer and less healthy; we often make bad decisions involving education, personal finance, health care, mortgages and credit cards, the family, and even the planet itself. The main concept of the book is that if you know how people think, you can design choice environments that make it easier for people to choose what is best for themselves, their families, and their society. It’s all about choice architecture. An important concept that we’ll explain in the next paragraph. But before we dive deeper into choice architecture, it’s good to know that there lies a very important concept underneath the nudging theory. A concept introduced in the book called Libertarian Paternalism. Paternalism = Do what you can do to improve the welfare of people. Point people in the right direction. The idea is to apply the techniques of the psychology of decision making and behavioural economics to improve decisions without limited choices. Or easier put, help people make better choices for themselves without restricting their freedom of choice. But by nudging them. Which brings us to the definition of a nudge. As Thaler describes it himself a nudge is any small feature in the environment that attracts our attention and alters our behaviour. You can nudge for good, or you can nudge for evil. Their book strongly focuses on the first, as the subtitle of their book states: improving decisions about health, wealth, and happiness. And we as a company take a positive take on behavioural psychology ourselves as we strongly live by our mission to unlock the power of behavioural psychology to nudge people into making positive choices in work, life, and play. But how do you achieve this goal? That’s what the next section is all about: how to help people make better and healthy choices. If you want to help people making better decisions, you can achieve this with better choice architecture. But what is a choice architecture? Anyone who designs the environment in which people make choices is a choice architect. There’s choice architecture all around you. Think about menus, curriculums, or store layouts that decide how you walk inside a store (you probably all have been in an Ikea once, there it’s obvious how choice architects have designed the way you cruise the Scandinavian furniture epicenter). A choice architect makes choices about how to present information or an environment for you. Although nudging is all about maintaining people’s freedom of choice, choice architecture isn’t neutral. You can compare it to regular architecture; it’s not possible to design regular neutral architecture. Think about the design of the building you’re probably in right now: it’s not possible to have designed that building completely neutral. It had to have doors, stairs, etc. The point is: you always have to make a choice. Choice architecture is not neutral. But some designs are better than others. Why not do it in a way that makes people feel better? That’s what nudging is all about, and which is the theme of the book ‘Nudge’ to help people towards making better choices. People make better decisions if you provide the right people with the right incentives. This goes beyond monetary and material incentives, but also includes psychological benefits (eg peace of mind). A warm plea is made for more disclosure to help people make better decisions. In the book referred to as RECAP: Record, Evaluate, and Compare Alternative Prices. Make it easier for customers to compare what they are truly paying for, and ensure that all hidden fees are exposed. Defaults what happens if we do nothing. Think about your screensaver. Even if you do nothing it will activate. Defaults are sticky, as inertia rules in all humans. We tend to stick to the automatic choice that’s made for us. We for example hardly ever change factory settings on our phone. In Nudge an example is given about joining a retirement savings plan. If the default is to join, most people do join. If you have to actively choose to join only 30% does so. A good way to help humans improve their decision making is to provide feedback. 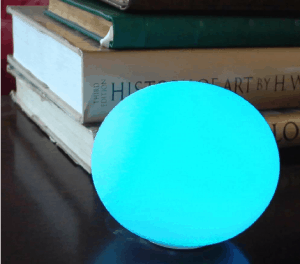 A good example is the Ambient Orb as developed by Clive Thompson that helped people save energy. Electricity isn’t visible, the ambient orb gives feedback on how well you’re doing by changing colour. 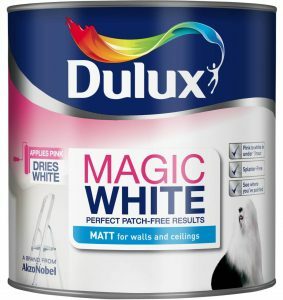 Another example of giving feedback is paint that is pink when you apply it, but turns white within an hour. People often paint white ceilings white again, and it’s hard to see if you missed a spot. By making the paint pink, it gives you immediate feedback on what is left to paint. Expect people to make mistakes and design for it. 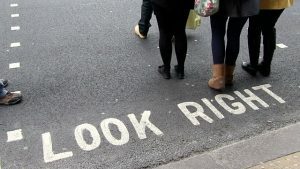 A very good example of libertarian paternalism that actually saves lives are the ‘look right’ signs in London streets. You can still watch the wrong way, but you’re directed to look the right way. When there’s an overload on choice, people tend to find ways to simplify them and break them down. Good choice architecture will find ways to make this more evident for people. An example cited was the choice of paint. Instead of using words like “Roasted Sesame Seed” or “Kansas Grain,” consider arranging similar colour themes next to each other. This could help people to choose the right shades and hues. Don’t use bans and mandates, just nudge. 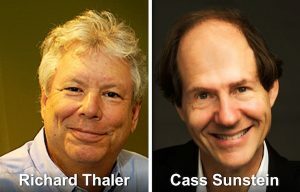 If you want to hear Richard Thaler explain the basic concept of nudging himself, take a look at this video. It’s 18 minutes. Step by step, behavioural economics, and psychological science have expanded their reach to become an established part of the business, policymaking, and regulation – for anyone seriously interested in both understanding and changing behaviour. And within marketing and market research, behavioural economics has become a required area of expertise and competency. We are now witnessing the next big step – the creation of the role of the Chief Behavioural Officer (CBO). This move will ensure that behavioural science has a voice at the highest level inside companies and institutions, a clear demonstration of the impact and value it is generating. 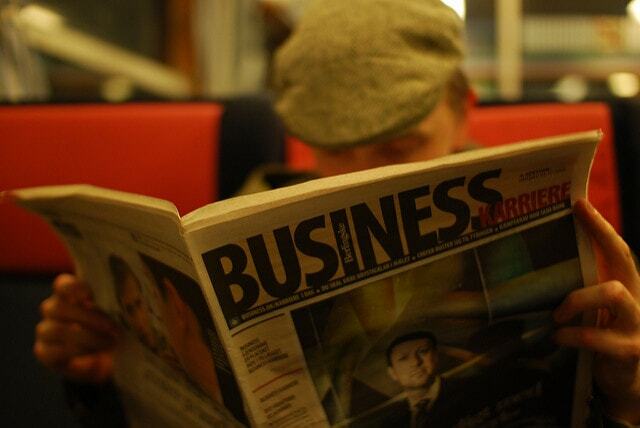 In this article, we look at how, within the last decade, this has become the new reality. We identify two main drivers and examine how behavioural science is increasingly being factored into everyday business, policy decisions, and common practice. First, though, we take a closer look at the trend of the CBO role and in-house behavioural insight teams. Cover image by Thomas Angermann under Creative Commons License. Master the method and tools to change behaviour in our two-day masterclasses at the Behavioural Design Academy. Create, prototype and test your marketing challenges in 5 days with SUE’s Behavioural Design Sprints. Want free training, tools, and tips in your inbox? Join 2500+ others. Sign up right here, right now for free. When terrorism is staged for YouTube, and all sides are media-savvy, the military is turning to the behavioural sciences for help. In 1955 Robert Oppenheimer, the physicist who led the project that developed the first atomic bomb, addressed the American Psychological Association. He warned that both physics and psychology could endanger humanity but that psychology “opens up the most terrifying prospects of controlling what people do and how they think.” Despite Oppenheimer’s warning, the idea that you could change human behaviour to win a war, rather than winning a war to change human behaviour, languished as an also-ran in the cold war arms race. 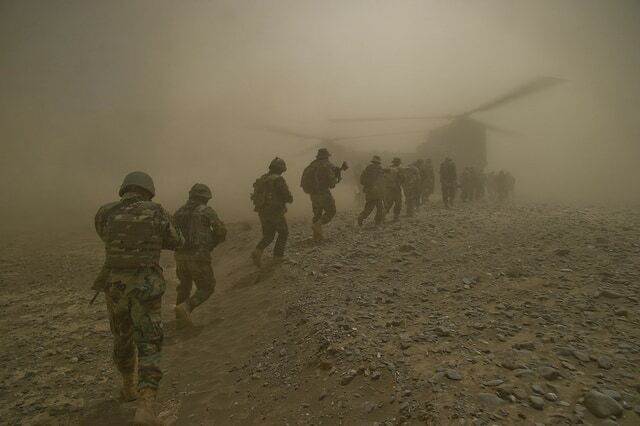 But as information technology has begun to globalize and behavioural science has entered the mainstream, there is an increasing move to put psychology at the center of military operations. Cover image by DVIDSHUB under Creative Commons License.